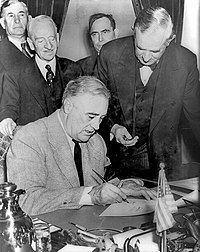 President Franklin D. Roosevelt signs a declaration of war against Germany on December 11, 1941. A declaration of war is a formal declaration issued by a national government indicating that a state of war exists between that nation, and one or more others. Declarations of war have been used in diplomacy since the Renaissance, when the first formal declarations of war were issued. In an effort to force nations to resolve issues without warfare, the United Nations Charter attempted to commit member nations to using warfare only under limited circumstances, especially for defensive purposes only. This page was last changed on 22 June 2015, at 20:45.